The Easter Parade on Fifth Avenue has become an annual tradition for New York's Loungerati set. The parade can be more accurately described as an impromptu promenade of the well dressed began in the late 19th century. 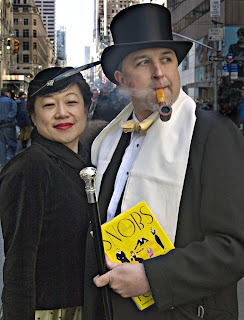 I began attending back in 1999 with my partner in crime Bena and our style guru and impresario, Brian P. At the time, the Easter bonnet and eccentric hat tradition was making a big come back so the event was a real eye opener for me. Now I am not one to make replica Shea Stadiums or St. Pat's Cathedrals from paper mache and sport it my head, I am more of a tilted fedora man. For a haberdashery afficiando with a penchant for stick pins, ascots, and the best English and Italian shoes, there is no place better that to let your dandy fop out than at the Easter Parade. Rain or shine! This year was no different and though I could not attend due to obligations in a certain City of Sin, Loungerati's own Effervescent and his lovely new bride Sara made the scene. Be sure to check out next weekend's New York Times Style section for the Easter Parade photos! The inimitable Fredo, conducting his rounds on the barfly’s beat, alerted me that changes are afoot at one of my favorite night launching spots, The Minetta Tavern. I’ll forgive McNally’s French blast but will point at that Bena (Loungerati's Seattle chief and Frenchman) has been a patron of the Minetta Tavern in the past and won’t be discriminated against on my watch. Minetta Tavern started off as a speakeasy during prohibition, and then served as a neighborhood bar for a couple of decades. Over the years, all of the usual suspects have been said to grace the barstools: Ernest Hemingway, Joe Gould, the Loungerati. Reader’s Digest started in its basement. The place has a lot of stuff on the walls too, and I like that because it gives you something to do other than read while you’re waiting for friends. In the front, you’ll find caricatures that hearken to it’s past as the local bar for upcoming actors who performed at the old Provincetown Playhouse in the area, and you’ll see a lot of autographed pictures of Italian celebrities from the ‘50s like Rocky Graziano and Phil Rizzutto. In the back is one of the nicest Italian murals in the city. 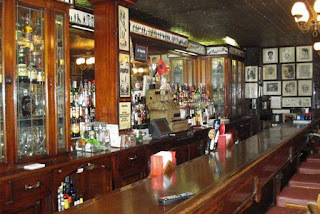 The bar is said to have been home to one of New York’s greatest bartenders, an Italian feller named Manny. The place was bought by a bunch of Russians about 10-15 years ago. Every time I saw the guy I thought was the owner, I made him promise not to change the place and he’d say “why would we buy a place like the Minetta Tavern only to change it?” Salud, Comrade. One day, Fredo, some guy named Tommy and I was in there for a pre-game drink and we got to complaining about the music – Russian techno. We prevailed on them to change the music, but all they had in our vein was a Harry Connick Jr. CD which we had to accept given the circumstances. A few days later, I returned and donated my usual Frank Sinatra and Dean Martin “Viva La Musica Saloon Starter Set” (Sinatra’s Reprise greatest hits and Martin’s “Gentleman of Song”) because that’s what good loungers do; we work to make the world a better place. (Now they use Sirius Satellite and they’ll put on “Siriusly Sinatra” for you, if it isn’t already on). As I said, I treated the Minetta Tavern as a launching spot on nights that I knew were going to be “good.” I chose Minetta because it was a “real” bar and they served big drinks, in big glasses. Also, since it was in my neighborhood, this was one of the few places that I would be at first. It was also easy to give directions to: the corner of Minetta and MacDougal. Everyone knows how to get there. Also, the entrance allowed for everyone to make a nice, dramatic entrance. This was fun for making fun of Grumpy Ol’ Hepcat the night he wore jeans. I also liked to start off my night at Minetta because it was always empty (I like empty bars) and the place didn’t smell like Pinesol at the beginning of the shift. These are important things. The place just got you in the mood for a night on the town. I’ve never been there at closing. So now McNally has the joint, and for a paltry $1.2 million. I got to tell you, that number pisses me off. If I could ever buy a bar, it’d be the Minetta, and if I knew it could be had for $1.2 million boxes of ziti, I would have convinced my restaurant friends into buying it. Hell, the Argentinian steakhouse my friend just built cost him $5 million. We could have had a Minetta! As far as changing the menu, I’m ok with it. I never ate at the Minetta Tavern. No offense to the Russians (and we all know Mexicans are making the food in the back, anyway) I only trusted the place for booze. I might look like a sucker but I’m not paying $19 for a plate of rigatoni. Instead, I pay $300 for a plate of Rigatoni at Volare on 4th. I think that McNally will change his mind if the usual clientele balks at the new menus, but we’ll see. As long as he keeps his promise and doesn’t mess with the look of the place (you can take the TV out of the bar, though) we’re not going to have any problems. poured and smiled and listened. Too bad you never met him. if you listen quietly to what's going on. Giancarlo Zingaro and I rolled into Ferdinando's Focacceria in Brooklyn's Columbia Heights neighborhood just as the sky opened up. Francesco Buffa, the owner and chef, was by door and welcomed us in from the rain. The self styled "Cucina Siciliana" was founded in 1904 and appears as if it has hardly changed since the turn of the century. The tiled floors, copper ceiling, beautifully restored storefront, and vintage striped awning are straight out of Once Upon A Time in America. I removed my fedora and signaled for a table for due. The lovely waitress sat us under a enormous map of Sicily and handed us the menu. Now for the hard part. There are so many delicious options on the menu. So we decided to order a sampling of the antipasti and go with the specials for entrees. I had the Pork chop pizzaiola with caviatelli and red sauce. Giancarlo opted for the Pollo Parmegiano with rigatoni stuffed with ricotta. The waitress promised the pork chop would be so tender that I wouldn't even need a knife. Naturally, I was skeptical, so she took my knife away and gave it to Giancarlo to "hold." Now I was in Sicilian restaurant sitting across from a Palermo FC ultra in possession of two knives! I didn't like the odds but who could argue with the truth. The chop was buttery and so soft I could cut it with a fork! Meanwhile, GZ could barely finish the sublime stuffed rigatoni and chicken parm dish. We washed the feast down with a robust Nero D'Avola. As we finished up with espressos, the rain subsided so we paid the check and headed to the next destination. We walked a few blocks in the crisp early March air and grabbed a taxi. We were heading east to Prospect Heights to check out the new speakeasy appropriately named Weather Up. Brooklyn, NY - For many years, I have saved up to buy a Vespa motorcycle by Piaggio. My love of the Italian scooter and the dolce vita culture it sprung was looking like a reality this year when my Vespa fund finally achieved its' goal. Finally, I had enough to buy a Vespa PX150, plus two helmets, plus security chain, severe weather cover, insurance, even morotcycle lessons required for the NYS motorcycle license. I have riden the bikes when I was a student in Rome, but I need a refresher course, especially on the new versions of the model. Well, now that purchase is on hold. Recession worries are making me check my spending on big purchase items such as the Vespa. I even looked into cheaper varieties such as the Stella. This classic, made in India, is a version of the original Vespa P150 model. The two stroke 150cc motorscooter is attractive at under three and a half grand and one can chrome it out a la Quadrophenia if that's your fancy. But still I'm weary. I may want to hold on to my devaulating greenbacks just a bit longer as a cash reserve in case the economy goes to hell. So the subprime/credit market/economic debacle is hitting home. I really thought this was the year to get on two wheels. It still maybe but I'll err on the side of my gut instincts and sit tight for now.